My maternal family often reminisce of simpler times, when extended families weren't all that that extended and neighbours were simply a part of ones own clan who lived next door. A day that my grandmother and mum often joked about was when they on a whim decided to have a frugal BBQ on our second storey balcony. So the humble desi grill a.k.a sigree was brought out, fresh pieces of coal were bought from the raddi wallah at the end of their colony and a small fire was lit. Pieces of chicken that were marinated overnight were brought to the fore and some fifty odd neighbours were invited to partake in their rustic fun filled evening. The food they said was cooked to perfection and the taste was beyond compare, the evening made way for night and friends left for the day, the mess of merriment was cleaned and the coal fires extinguished but what never left was the smell of smoke, they tried tens of different options but to no avail, for the next two months all of my grandmothers students were welcomed by the tell tale smoky smell reminding the family of an evening long gone but its memory, in mood to leave. Its been over three decades since that smokin hot day, but the silent resolution of never ever burning another grill at home has stuck on. Now smoked is a flavour that I enjoy in all kinds of cuisine be it Indian or continental and as weird ideas often visit my brain I was struck with one such weird one on a rater uneventful summer evening. 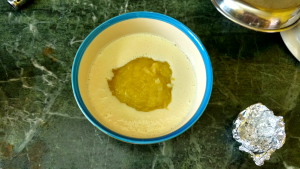 My four year old (easily the pickiest of eaters) made me make a small batch of custard which he then decided (like he usually does) that he wanted nothing to do with. 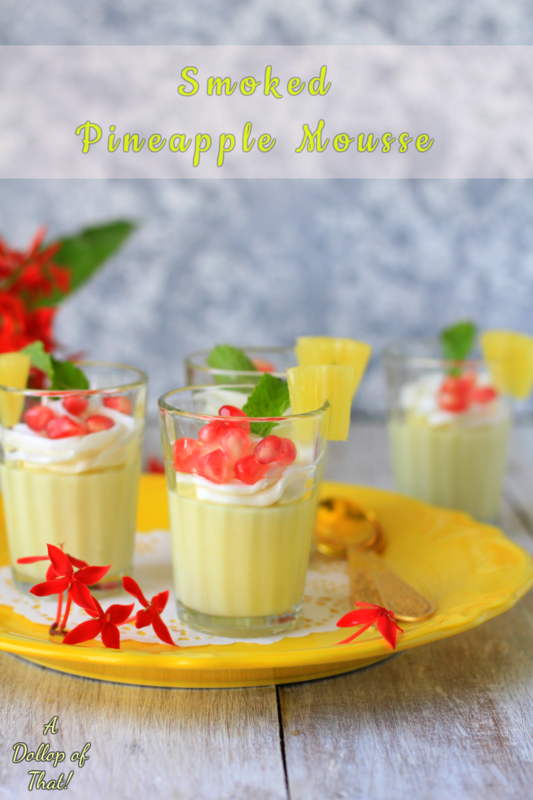 This left me with a half eaten dessert and half tins each of condensed milk and heavy cream, not wanting to chuck either of them in the bin I thought of making this easy eggfree pineapple mousse and gave it a smoky twist in memory of my dearest grandmother and her unending love for the kitchen and its inhabitants. Break the agar agar into small pieces and soak in 1/2 cup of water for about 10 minutes until it becomes soft. Pour cold whipping cream into a cold bowl and beat with an electric beater till soft peaks are formed, next add in the condensed milk and beat again till stiff peaks are formed. 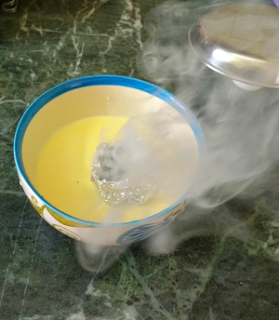 In another saucepan place the agar agar and water mixture and stir on low heat until it melts completely. This can take about 10 minutes. Do not allow this to boil. 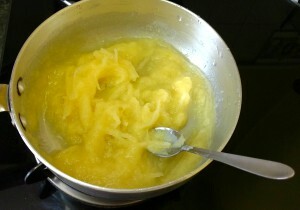 After the agar agar melts completely, pour the hot agar agar solution into the hot pineapple puree, stirring all the while. Slowly add the pineapple mixture into the cream and condensed milk mixture and beat well with a wire whisk until well blended. Now make a little cup from some aluminium foil and put it on the surface of the pineapple mixture, gentle put in a hot piece of coal into the cup and add a little butter on the burning coal, it will instantly start to sizzle and give off smoke, immediately cover the bowl with a plate or lid and allow to stand for 30 seconds for a mild smoky flavour or longer for a more potent one. 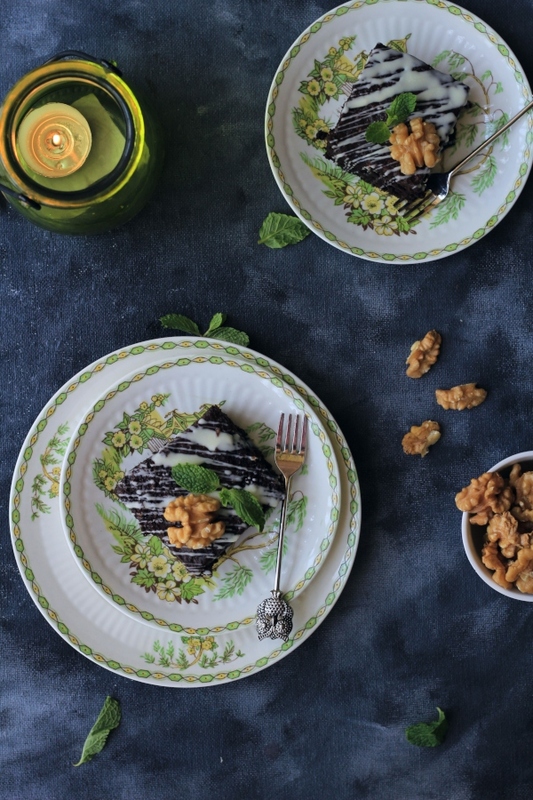 Remove the plate and the coal and pour into serving glasses or ramekins. 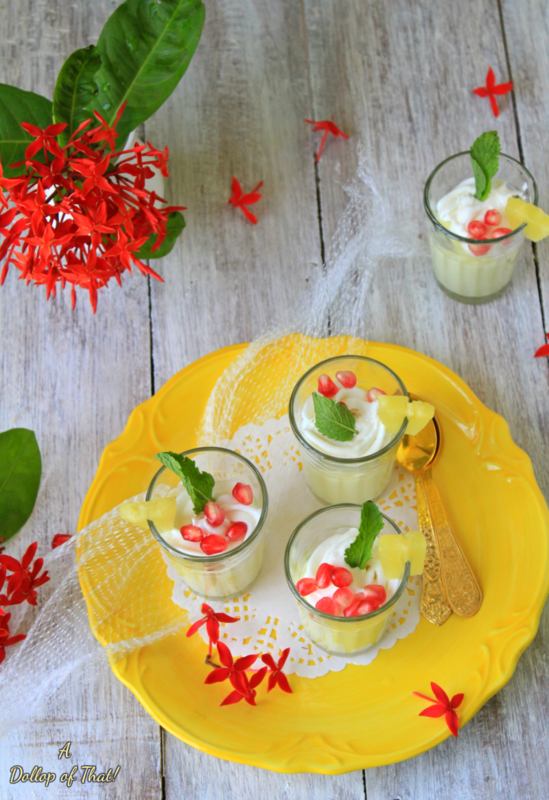 Garnish with a whipped cream rosette, some mint leaves and pieces of pineapple. Labels: Desserts, Kid friendly, Party Perfect! This mouse sounds excellent and the smokey effect would be amazing. Nice clicks.